Boston Terrier Rescue Team of the Carolina’s Spring Fling is Saturday April 25, 2015 Beginning at 10 am. At the Spring fling, ?Come shop with your neighbors and friends! Unique one of a kind items and gifts for your family and friends. Money raised will help support their?Boston Terrier Rescue mission. 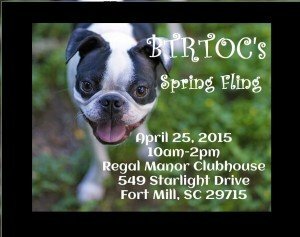 BTRTOC helps rescue Boston Terriers in NC, SC, VA, and GA. Our Mission is to rescue, rehabilitate, and find permanent, loving, and responsible homes for our Boston Terriers.